PulpTech is exited to introduce a new moisture measurement technology for chips and bark. As you know there has not been available a reliable method to measure chip moisture going to the digesters. But now there is one. The person behind the technology is a former Kajaani employee who designed the Kajaani Microwave consistency transmitter and is now a partner in this new Finnish company called Senfit Oy. You can see the on-line version of the moisture meter in action here. Please click here to fill out the questionnaire for a quick ROI calculation and e-mail it back. My contact information is at the bottom of the page. The CMA On-Line Moisture Analyzer is designed for measuring Chip Moisture in the most demanding applications feeding digesters. It uses new microwave technology, signal processing and continuous automatic sample preparation to provide reliable moisture measurement for Advanced Digester Control. Payback for this technology can be counted in weeks. The microwave measuring principle uses the dielectric characteristics of the chips being measured. The microwave electromagnetic waves penetrating through the wood chips are changed by the properties of wood being measured. The microwave signal is swept by digitally changing the frequency of the microwave signal and the resonance is measured and analyzed for moisture content and density. The microwave signal is enclosed in a square metal enclosure which is continuously fed with refined chips using a small screw conveyer. A 4-20mA moisture signal is provided for DCS for Digester control. The Moisture Analyzer is suitable for process control as well as an analytical information source. Moisture variability is one of the major sources of the Kappa variability in any Digester today. Reliable moisture measurement has not been available for wood chips until now and most of the Digester Control Systems consider moisture being constant, which is far from the reality. There is moisture variability related to weather, source of the chips and seasons. Alkali/Wood Ratio is one of the major component of sophisticated Digester Control and cooking liquor efficiency is directly affected by the moisture content of the chips. High moisture content will undercook the chips and create shives and bad quality fibers. On the other hand, low moisture will overcook the chips, decrease the yield and make the fibers too soft. Once on-line moisture measurement is implemented, Kappa variability related to chip quality is almost eliminated. Reduction in STD of the Kappa can than be directly used to drive Kappa target higher and increase yield resulting in higher production. For example, a digester with annual production of 800,000 tons can increase yield by 2,500 BDT/year, which converted to dollars is about $1,5 million of more sellable product. 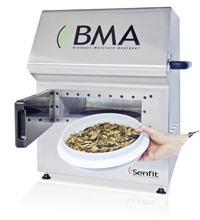 The BMA Laboratory Moisture Analyzer offers unique features for field and laboratory use. 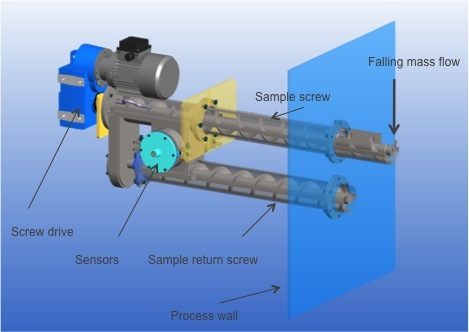 It uses microwave technology and advanced signal processing to measure moisture content of any Bio Solids material, which as of today has been a very time consuming process, taking at least 24 hours before the readings are available. With this new technology, results are processed in less than 1 minute. Applications are in wood chips, bark, all forest material, peat, saw dust, slurry of the water treatment plant and community trash. The analyzer is provided with PC interface for easy analysis of the moisture readings. The analyzer measures total moisture throughout the total sample, even with thick samples. Sample preparation starts with weighing about one pound (500 grams) of material and dropping the material into a sample tray. Next, insert the tray into the analyzer, close the cover and activate the sample reading. In a few seconds the reading is ready on the computer screen. The testing process is very simple and doesn't require any special skills.